Listen to "Dying for Love" on your iOS and Android device. Dr. John Yelenic was a successful dentist in a small Pennsylvania town. When he met Michele Kamler, he thought he'd finally found the woman of his dreams. She was beautiful, intelligent, and seemed to want all the same things out of life as he did. Michele married Yelenic in 1997. But by 2002, the relationship fell apart...and what followed was a bitter, three-year-long battle in which Michele made demands for Yelenic's money and even accused him-falsely, it would later be shown-of sexual abuse. Michele began dating Kevin Foley, a Pennsylvania State Trooper. When, in 2006, Yelenic was found murdered-slashed to death in his own home-Foley was the prime suspect. At the time of Yelenic's death, Michele was listed as beneficiary on more than $1 million in insurance benefits. Did Foley believe Michele stood to inherit this money? Or did this well-known hot-head simply snap? 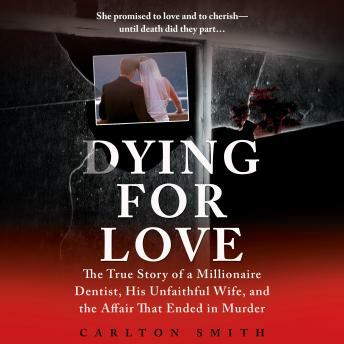 This is a shocking true story of greed, corruption, and coldblooded murder. Worst narrorator ever!! I can't get through this because I can't take the robot voice!! !